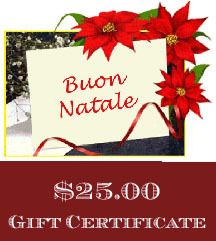 Gift Certificate for $25.00 (USD). You will receive an email with the Gift Certificate Code and instructions for using. The email will also contain a link where you can print out our gift Certificate and write your own personal note.